Super Savings Item! 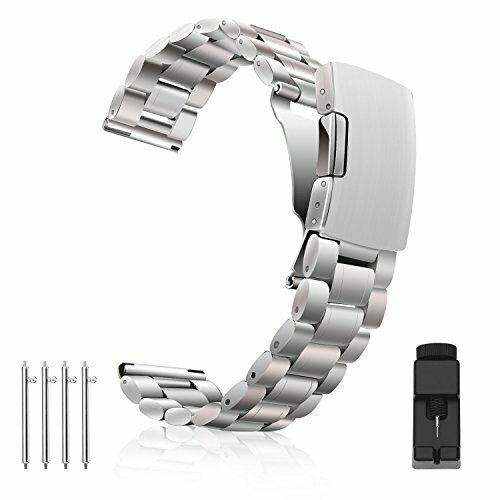 Save 35% on the Vetoo 304 Stainless Steel Metal Watch Band For Samsung Gear S2 watch,20mm watch band for SAMSUNG GEAR SPORT watch,For Pebble watch,Quick Release Replacement for Men Womens-20mm, Sliver by Vetoo at Envy This Stuff. MPN: SUS-AV-Sliver20. Hurry! Limited time offer. Offer valid only while supplies last. Premium Quality- Made of premium-quality 304 stainless steel ensuring its toughness and durability in use. Black polished surface brings you a strong sense of high-class quality and elegance. Easy click-to-open clasp prevents it from popping off or breaking by over-strength pulling. Adjustable Length -- The watchband's length is adjustable from 125mm to 175mm (3 links can be removed at each side). Extremely flexible links are connected firmly, worries free from the links falling off. Suitable For Watches -- The band is precisely designed for your Samsung Gear S2 Classic, Smart Watch Fitness, Fossil Q Gazer, Garmin Vivoactive 3, Garmin Vivomove HR, Huawei Watch 2, Moto 360 2nd Gen Men's 42mm, Pebble Time Round Large, Samsung Gear Sport, Withings (Nokia) Steel HR 40mm and most traditional or smart watches that use 20mm spring bars. Features: Guaranteed for all men and women. Precision cutting hole, can be personalized regulation, perfect fit wrist. Exquisite and beautiful packaging, Including 1* watchband + 1* spring bar tool + 4 * pins. (While most people can do this with just their finger we also include 4 assistant tool to meet your needs. If you have any questions about this product by Vetoo, contact us by completing and submitting the form below. If you are looking for a specif part number, please include it with your message.